The UN says it fears rebels from the Lord's Resistance Army (LRA) in DR Congo are advancing towards the Central African Republic (CAR). The UN refugee agency says villages are being set alight, women raped and children abducted. LRA rebels massacred close to 500 villagers in northern DR Congo in the past week, near the border with Uganda. The CAR is reinforcing its border. Meanwhile, there are reports of LRA attacks on villages in southern Sudan. UNHCR emergency team leader Margarida Fawke said the situation in DR Congo was catastrophic. "The villages are getting burnt, the people are getting killed. We are getting reports that all the female bodies found are naked, so we assume they were raped before they were killed," she said. "There is a lack of food and there is a danger of a medical and a nutritional emergency in the area," she added. The UNHCR said it would send a team into the area on Saturday to investigate the situation. The Catholic aid agency Caritas said LRA rebels killed 150 civilians in Faradje, almost 75 people in Duru and 215 in Doruma in the past week. Meanwhile, the governor of the Sudanese region of Western Equatoria, Jemma Nunu Kumba, said that insecurity was increasing along DR Congo's border with Sudan. "The LRA are attacking and looting communities, including parts of Maridi, Ibba, Yambio, Ezo and Nzara counties, as they continue to escape the regional operations," she said, referring to areas bordering on the Democratic Republic of Congo. 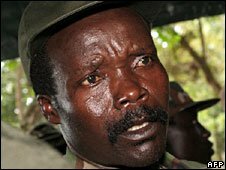 The armies of Uganda, South Sudan and DR Congo carried out a joint offensive against the rebels in mid-December after LRA leader Joseph Kony again refused to sign a peace deal. The LRA leader, who has lived in a jungle hideout in north-eastern DR Congo for the last few years, is wanted by the International Criminal Court for war crimes and crimes against humanity. Uganda's government had been involved in lengthy peace negotiations with the LRA, hosted by the South Sudanese government.